The single use cup is one of the defining products of our era. Walking down a street, hot drink in hand... It's our new hearth, the provider of essential warmth and comfort but without contradicting our longing to be mobile and possession-free. And I suppose it will be around for quite a bit longer yet, despite concerns about waste, recyclability, and carbon footprint. The cups shown here are Christmas specials, prettier than the standard disposable cups at other times of year. In Islamic countries the big coffee chains issue similarly decorative cups during the nights of Ramadan. There were news stories a couple of years ago about the cups being unrecyclable, because they have a thin layer of plastic bonded to the cardboard. For years we had been chucking them in cardboard recycling -- apparently that was wasted effort. Somerset waste facilities now have a separate bin for the cups, along with other plastic-bonded items such as milk and juice cartons. I suppose they're now properly recycled, though I wonder if that involves packing them off to questionably-monitored facilities in foreign countries (a subject much in the news recently). Costa say they'll recycle any single-use cups you hand in at their cafés. 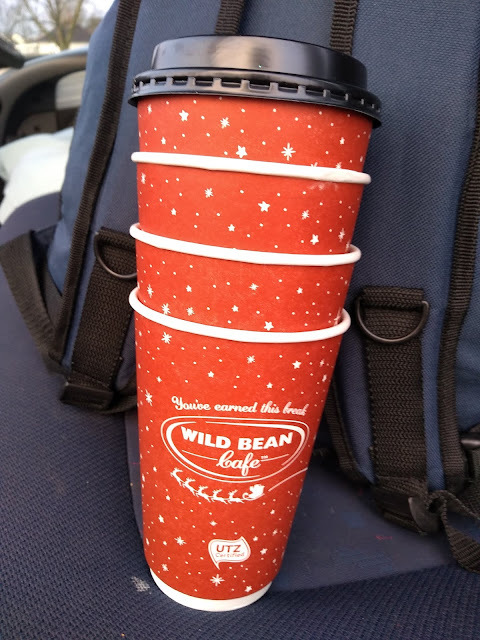 Another local chain, Coffee #1, provides fully compostable single use cups. You'll also get a 25p discount if you bring your own re-use cup. Most of the big coffee chains offer a similar incentive. Pret A Manger (50p), Starbucks (25p*), Costa (25p), Greggs (20p). Caffè Nero don't discount the drink itself, but they do give you a double stamp on your loyalty card, which I reckon equates to about 25p. *Starbucks also charge an extra 5p if you want a single-use cup, so they could argue you're "saving" 30p. So what about the carbon footprint? Common sense would say that all those cardboard cups in landfill are locking up a lot of carbon that will take many years to be released, so maybe that's a good thing? But carbon dioxide is also released during the manufacture of the cups. What about the emissions from manufacturing plastic, porcelain and stainless steel re-usable cups? I can't help wondering about all the re-usable cups that are purchased and then never, or hardly ever, re-used.... And what about the emissions from washing-up machines? These are difficult sums. And behind all such ruminations comes the thought that really what's required is to go to less cafés, drink less tea... live a little less. 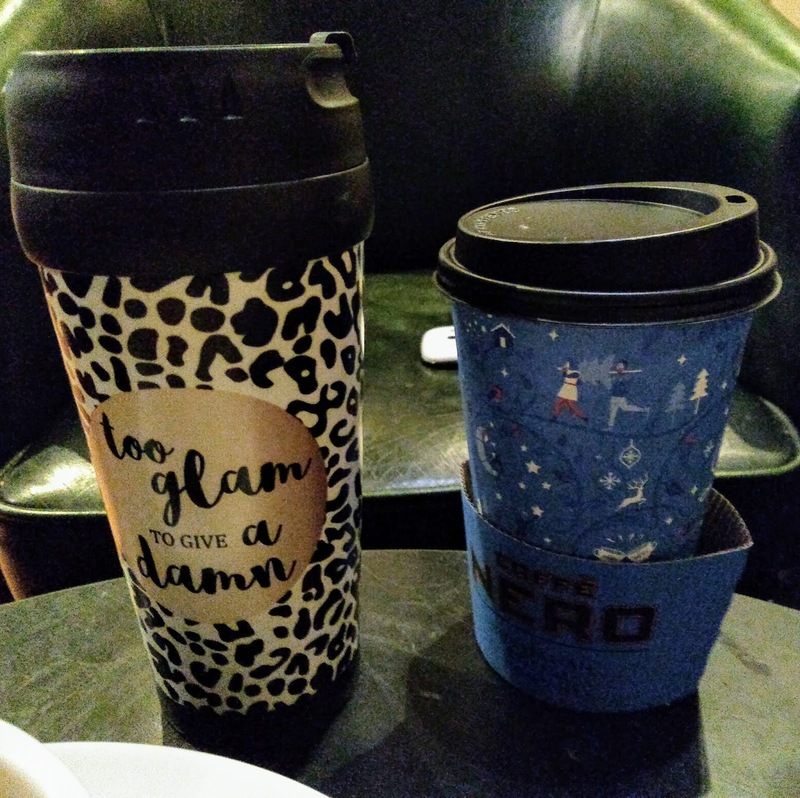 Anyway, things may be different in the metropolis but here in peripheral Britain I still don't see that many people handing over re-use cups to be filled. I've become one of them in the past year. I'm sticking with it, though frankly it's not ideal. Carrying my cup wherever I go is boring. Washing it up properly between each drink is often impractical. Tea in my re-use cup never tastes quite as good as tea in a single-use cup. Anyway it seems there's still a place in the world for our planned booklet (one of many), 100 Uses for a Costa Cup. The first of those uses is making more hot drinks in it. While travelling through Europe last summer, we must have got forty drinks out of each one before it finally fell apart. If you fold over the top, you have a crush-proof container for, say, a slice of cake. Or for food waste, or nuts, or sea-shells. Or, uncrushed, to drop screws and other small things inwhile you're doing some car maintenance. Or a pen holder, a tissue dispenser, a coin pot. One cup jammed inside another to make a leak proof disposal container for e.g. oil, baby-wipes. An impromptu vase for flowers and grasses. An ashtray. A subject of known size in a photo or drawing. A mould, a pastry-ring. A prop when acting. In children's games (almost as versatile as a cardboard box). A good scoop for water or sand.